We all dream. Do you wonder what yours mean and how they can help you? Do you have trouble remembering dreams? Conscious Dreaming: A Spiritual Path for Everyday Life will help you find answers. 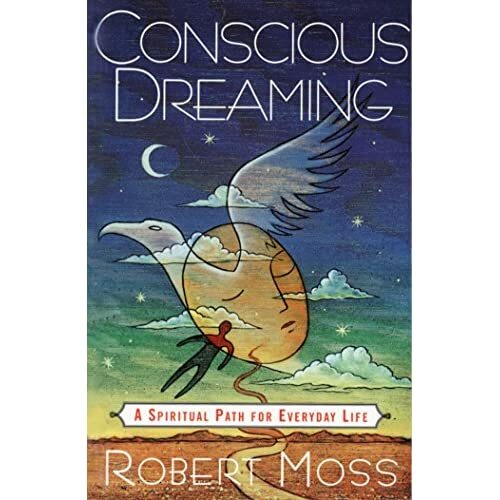 Conscious dreaming, according to author Robert Moss, is to be aware you are dreaming while you are dreaming. It goes beyond just an awareness of dreaming while asleep to actively participating in accessing guidance that offers path to wholeness and integration. It is a way of life that allows you to explore your dreams and to manifest the energy and insight of your dreams in daily life. This is not a dream dictionary, nor a book about dream theory. It is a practical guide to working with your dreams as a way to live your life more effectively. To be truly conscious is to be aware of how your thoughts and emotions shape the worlds you inhabit and that you have the power to change them. As you become more conscious in dreams, you become more conscious in life. Moss includes tips for improving dream recall; beginning and keeping a journal; understanding your dreams; dreaming while awake; and many more ideas and exercises to expand the role of dreaming in your life. For those who have never worked with dreams or feel they can’t remember them, Conscious Dreaming will guide you step by step in becoming an avid dream worker. Moss provides useful suggestions for remembering or “catching” your dreams and offers nine steps or “keys” to working with those dreams. For those who have been steadily working with dreams, this book is certain to provide new insights and techniques to further your dream work, including dream reentry, shamanism, and working with a partner or group. While Moss encourages the use of approaches and techniques included in the book, he continually reminds us that, ultimately, each of us is our own dream expert. In working with dreams, it is experience, not theory, that matters. Our dreams are multilayered and we often dream in symbols. He points out that these symbols may be literal, figurative, or both and that they call for exploration, not merely interpretation. Keeping a dream journal is critical to unraveling the personal mystery of dreams. Moss offers specific ways to begin and maintain a journal that will help you track and learn about your health, relationships, desires, goals, purpose, and direction. It also helps to activate intuition, to become more alive to the dreamlike symbols and synchronicities of waking life, and make necessary changes. Moss also teaches how to recognize and foster dreams for precognition or dreaming true, healing, creativity, and visits from the deceased, explaining that they are entirely natural. He discusses shamanic dreaming and how to work with dream guides as ways to expand and explore the role of dreaming in everyday life. Where your explorations in conscious dreaming will take you will be determined by your purpose, your courage, and your familiarity with the many levels of dreaming. What makes this book stand out among the many other dream books out there is its accessibility. Conscious Dreaming is easy to understand and entertaining. Every section includes information and ideas, as well as examples that help tie it all together. Examples include actual dreams and meanings derived by the dreamer. Some are quite humorous, others are like reading a mystery novel, and still others seem to be straight out of a science fiction movie. In all cases, Moss shows how the dreamer became more aware of aspects of his or her life. Moss gives us the tools to dream and live our lives with intention. It is not enough to decide what your dream means, you need to do something to bring the energy and insight of the dream into your waking life and to honor the source from which it comes. Conscious Dreaming teaches how to use dreaming to develop a powerful guidance system for living a more successful and more soul-full life. For all dreamers, this book deserves a place right next to your bed. Youtube- Present! – Dreaming with Robert Moss (part two) Donna Baker Church is a freelance writer and editor. Donna may be reached at awordchick@yahoo.com . Robert Moss Podcasts with Merlian News! Robert Moss is a lifelong dream explorer, a shamanic counselor, novelist and historian. His fascination with the dreamworlds springs from his early childhood in Australia, where he survived a series of near-death experiences and first encountered the ways of a Dreaming people through his friendship with Aborigines. For many years he has taught and practiced Active Dreaming, an original synthesis of dreamwork and shamanic techniques.